Leading Causes of Underride Truck Accidents | Johnson & Gilbert, P. A. Why Do Truckers Cause Tragic Underride Truck Accidents? Any commercial truck accident can be dangerous for the victims in passenger vehicles due to the much larger weight and size of the trucks. However, an underride crash can be one of the most horrific, resulting in victims suffering life-altering injuries or death. Many of these wrecks occur on highways where the vehicles involved are traveling at much faster speeds—increasing the likelihood of catastrophic injuries and fatalities. An underride accident is one where an SUV, van, or smaller vehicle becomes stuck underneath a big rig's trailer. The bottom end of the trailer can sheer off the much smaller vehicle’s windshield and crush its frame. These violent wrecks occur in both rear-end and side impact collisions. Incorrect turns. Making a proper turn is much more complicated for a truck driver than a motorist. If the truck driver turns too widely, fails to use his signal, or otherwise improperly turns, he could cause a side impact crash that traps the passengers of the other vehicle under his truck. Braking too quickly. Depending on the travel speed, a commercial truck may require the length of up to two football fields to come to a complete stop. If a trucker isn't paying attention and slams on his brakes, an unsuspecting motorist who is otherwise a safe distance behind can rear end the truck, causing the vehicle to slide underneath the rig due to the force of impact. Inadequate truck maintenance. When a truck’s lighting isn't maintained, it might not be clearly visible, which can be a greater problem in fog, heavy rain, and snow. Additionally, brake light malfunction can make it can be almost impossible for a motorist to know if a truck is stopping before it's too late. Broken underride guards. When a truck’s underride guards are defective, the possibility of a passenger vehicle sliding underneath the trailer is more likely. Operator driving errors. Truck operators are often negligent in these accidents for a number of reasons, including failing to check blind spots, speeding, distracted driving, intoxication, and drowsy driving. 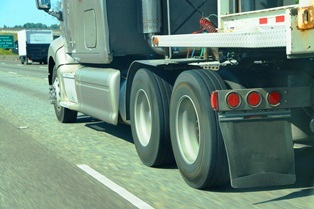 Did you or a family member suffer injuries in an underride truck accident in Florida? Our experienced truck accident attorneys understand how devastating these accidents can be. We're ready to take over the burden of fighting with the insurance companies for the compensation that you deserve. Call our office today to schedule a free initial consultation to discuss your legal options and how we can assist you.